However, according to industry insiders, the ranks of these estimated 1,300+ brick and mortar retail stores may be about to be decimated. Some of the impending change will be due to consolidation, as national chains move into mom-and-pop dominated local markets. However, the majority of closures may be driven by the Department of Justice’s, now famous, August 29th memo. According to industry insider Rob Hunt, president of GrowLife Hydroponics, big accounts rather than home-growers or small-scale caregivers currently represent up to 90% of purchases from a typical hydroponics storefront. These big accounts are professional cultivators and dispensaries with licensed cultivation facilities, and they don’t typically require intensive hands-on service provided by the more than a thousand, mainly small retail outlets. According to Hunt, the main reason for hydroponics equipment manufacturers to sell through storefront retailers heretofore has been “plausible deniability.” In effect, the retailers serve as a legal shield between the large manufacturers and distributors of equipment and the end buyers. If the DEA or Justice Department comes calling, hydroponics-related equipment firms have been able legitimately to say “Well, we didn’t know who the end buyer was.” Retailers tried to protect themselves as well, with the storefront sign disclaimers. However, this hasn’t been a consistently successful strategy, and some hydroponics stores have been subject to prosecution or losing their leases in CA, CO and OR. 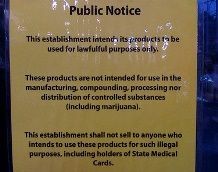 Now that Justice has said they will not go after state-legal operators who are acting in accordance with the eight guidelines, which are primarily centered around egregious public health and safety concerns along with intrastate-commerce and the black market, these manufacturers and distributors may not longer require a retailer shield in legal states. Adding to this development is the trend in MMJ-legal states with extensive dispensaries for consumers who prefer to buy cannabis at retail rather than growing it themselves, because dispensaries tend to have better pricing, quality and variety than what a typical consumer would grow at home. There is likely not a sufficient home-grow customer base in many areas to maintain the large number of hydroponics storefronts in operation now if larger professional accounts are serviced directly by the manufacturer or distributor. Key: this doesn’t mean that America’s half a billion dollar marijuana-related growing equipment is going under. In fact, it’s expected to continue expanding in step with legalization. It also doesn’t mean that all brick and mortars are going away – after all, some are legitimately needed to service local clients, and others maintain more than one business line out of a hydroponics storefront. It does mean, however, that the age of having a ‘home’ indoor gardening center on every other city block may soon reach its end. Having worked in the retail hydroponics market for the past decade; I have to say, in California, the contraction the author mentions started 3 years ago. The 40-50% margin model is dead. Gardeners are getting less and less for their harvests and expenses are rising. The only wiggle room in cutting costs is the price paid for consumable nutrients. I am doubtful that we will see a diminished need for manufacturers’ plausible deniability. Most of these wholesale distributors are dealing with international manufacturing and will still have those requirements, not matter what the US and states are doing. The highest quality ingredients for medical cannabis are only available through brick-and-mortar shops. Sell ’em while you can because that window is closing. Many of the large distributors and manufacturers do not wholesale their products through retail outlets so they can have “plausible deniability”, at least here in the east. That is a small concern but the primary factor in them selling wholesale through retail outlets because they don’t want the expense/overhead/cost associated with selling to a thousands of different buying accounts and all the additional BS that comes with dealing directly with the end user. Here in the north east I know for a fact that most manufacturers and all of the major national distributors refer their large legal medical grow buyers to specifically selected authorized retailers in Maine, RI and MA. Just like every other mega business model. The big national distributors would have to multiply the number of sales people 100 fold, make a million sales calls in a million different places. That would be crazy. The retail outlets will be or are already acting as the sales people basically, visiting sites, talking to the clients about the products, facilitating the order then taking a small margin on the sale. I do agree with Anne’s assessment that mega huge Walmart type grow shops will be the new norm unless people choose to shop local and with small businesses. Again, just like ever other industry! One thing I have noticed is the recent explosion of small, regional distributors emerging, sourcing directly from Asia themselves, some developing their own soil mixes or lighting fixtures. Exciting times. I used to go to these places to buy pots and fertilizer among other things for my tropical plant business. I went looking for some pots today, and noticed that 80% of them have disappeared .